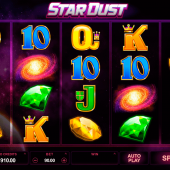 Stardust slot, which should not be confused with arguably the most famous online slot of all time - Starburst, is a retro arcade-themed title from Microgaming. This is a 5 reel, 4 row game, with a total of 40 paylines, available on all the typical devices for online play. Being a bit of a rip-off of Starburst it has stacked symbols in the base game and super stacked symbols during the bonus feature - last 2 reels only. 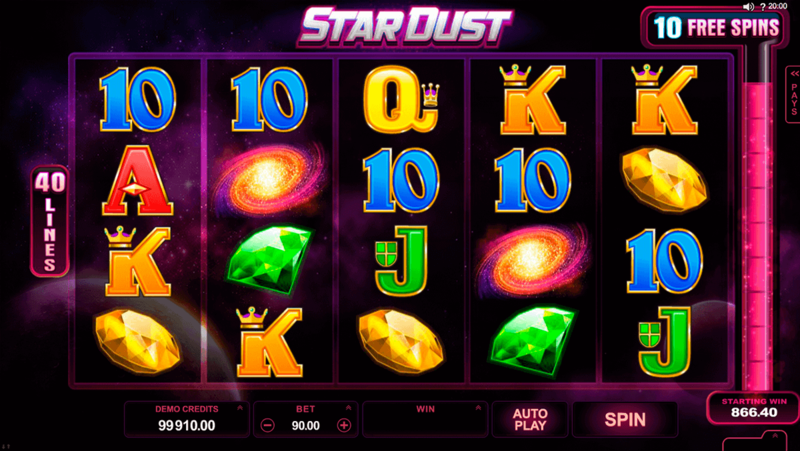 This game is all about the Free Spins feature, which is triggered by 10 gems, rewarding 13 free spins. The Radiant Respin feature can see up to 5 reels re-spinning for some reasonable rewards.